"Most of the £200m the sport receives each year from selling live pictures is from betting shops"
The importance of televised coverage of racing cannot be exaggerated. It is fundamental to the exposure of our sport and to its income. You have only to consider the benefits the sport receives from ITV coverage. Free-to-air TV allows many thousands of racing fans to indulge their hobby from an armchair. It also attracts a mass of casual viewers, a small number of whom will one day become committed converts to our sport. Racing must constantly remind itself of the importance of the balance between exposure and income. Those sports that have given in to the temptation of grabbing a higher income from paid-for TV channels may initially do well financially but their profiles invariably suffer through attracting smaller, more specialised audiences, even though football is an obvious and notable exception. We also have to remain vigilant to the prospect that any future government may decide that betting-related advertising should be banned on daytime TV. Clearly, it is this advertising that makes racing an attractive proposition for ITV and, without it, much of the commercial justification for covering our sport would disappear. But, while terrestrial television is massively important to racing as a marketing tool, its monetary contribution is relatively small. The bulk of the £200 million the sport receives each year from selling its live pictures comes from betting shops and, as everybody knows, the shops are due to suffer significant closures over the next two or three years as a result of the changes made to legislation effecting FOBTs. Various estimates have put this reduction at between 30% and 50% on the current 8,500 UK shops and, even taking the lower of those figures, still translates into an annual hit for racing of around £50m. While shop closures will obviously affect levy income, the biggest impact will be felt by racecourses which are the direct beneficiaries of payments for pictures either through Racecourse Media Group or through The Racing Partnership. And this in turn is very likely to impinge on the contributions the courses make to prize-money. Up to the point where the FOBTs factor begins to bite, racecourses will have done very nicely from their media rights deals. Over the past decade there has been a steady increase in this source of funding and there was more good news for the RMG racecourses when SIS took over the production of their programmes in the spring, providing a further significant financial boost. 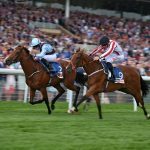 Although At The Races will lose their Irish racing coverage to Racing UK next year, they also have reasons for optimism. Under their new name of Sky Sports Racing, they will have the might of Sky behind them and their depleted portfolio of fixtures will at least be bolstered when Ascot and Chester move over to their camp. The extent to which all major sport is now dependent on media rights income is well illustrated by Premier League football, where TV rights attract such eye-watering amounts of money that, for some of the top clubs, gate receipts account for less than 10% of turnover. Racecourses are some way from being in that position but, if you take out the major festival meetings, you will find a course’s revenue from TV rights is more important to them than all their other revenues put together. Nobody likes to think of racing taking place in front of empty grandstands, but this happens all the time at small meetings during the winter months, where the only commercial justification for horseracing is to feed the off-course betting market, whether that means betting shops or, increasingly, live streaming to those who bet online. Like it or not, this is the reality of today’s world and one which the sport of horseracing must fully embrace if it is to survive and prosper.